formulation, combines all the elements required for hydroponic cultivation, plus it is extremely concentrated. 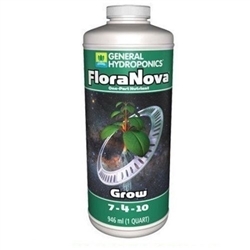 A very small amount of FloraNova mixed with fresh water will provide your plants with proper nutrition. FloraNova Grow®: Use this specialized nutrient for rapidly growing plants during the structural and foliar growth phase. or irrigation system to the desired ppm level (one to three teaspoons on average). need in one convenient bottle.